It’s hard to believe that it’s already been nine years since I bought my first computer before going to college at UND. It happened to be during the short, awkward part of Apple’s life when it was licensing the Mac OS to several third party Macintosh clone manufacturers. Apple’s PowerMac line was severly lacking, so I went with a clone from Power Computing, wha company that somehow managed to offer faster and less expensive Macs than Apple. Compared to the awesome design of the current Macintosh computers, my PowerCenter Pro 210 (that’s 210 Mhz of raw computing power) was very uninspired. You could even say it looked like a PC. 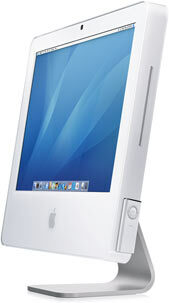 That Mac clone lasted me about four years, after which I decided to build my own Windows PC. I was finishing my undergraduate degree at the time and was taking several programming classes, so being able to run Windows made doing my homework quite a bit easier. It was also pretty fun picking out every single component of the computer, from the motherboard, to the video card, to the CD burner. A couple of years later, I made of few upgrades to my custom PC, popping in a faster CPU, a bigger graphics card and hard drive, and more RAM. It did a great job of keeping track of our music and photos and playing PC games (Half Life for me, The Sims for Casey). Four years later (six since I first built it) I was still able to use it on a daily basis, albeit slowly. Finally, about 1 1/2 months ago, we started having problems. Hard drive errors began showing up in the Windows error log, which caused some concern. More troubling though, were the random and very poorly timed sytem reboots which I believe were caused by a failing power supply. Needless to say, it was very difficult for me to trust our data to a computer that might shut itself down and never start back up again. So, about three weeks ago we ordered our replacement from Apple: the 20 inch iMac. We’ve had the new iMac for just over a week, and while I haven’t been able to spend much time working with it yet, I’ve very happy with it so far. It’s using the Intel Core Duo processor, which makes for a very responsive system. Also, it’s nearly silent, a special treat for us after living with a jet engine for six years. The addition of the iMac to our house means that we’re an all Apple home now. Casey is still using her 12 inch Powerbook, which is still chugging along, and we’ve both still got our 3rd generation iPods. We’re using an Airport Extreme for our private wireless network, which we’ve just extended with an Airport Express upstairs in the living room. The AirTunes feature built into the Express is very cool, letting us stream our music libraries through our stereo system. I haven’t completely escaped Windows yet, however. I’m using a Thinkpad for work, which is easily the best PC laptop I’ve ever used. We’ve still got a few Windows programs we’d like to run every once in a whlie at home too, so I’m probably going to try out the Parallels Desktop virtualization software for Mac OS, which lets you run Windows XP in a sandboxed environment right in Mac OS X. It’s in beta right now, but looks pretty promising! What do you like in particular about the Thinkpad? Is it the Lenovo version? Wow Sam – You’re quick! From what I can tell, my Thinkpad (the T42) was one of the last IBM-made machines. Of course everything is being serviced and supported by Lenovo now, but so far, so good. I’ve heard rumors that the Lenovo Thinkpads are noticeably cheaper feeling than the IBM ones, but I can’t verify this yet. We are supposed to get 4 new laptops in this morning, so I’ll take a look and see if they feel any different than our older ones. My only real complaint about my Thinkpad is that the LCD screen has about 7 or 8 dead pixels, which I can pick out very quickly now that I know they’re there. Otherwise, I love the heavy-duty hinges, the fingerprint reader, and the software utilities that are actually better than Microsoft’s built in ones.